How will your son learn what it means to be a man?. Robert Lewis provides biblical principles, and practical examples for a dad to use to equip his son for the "higher things" of manhood. 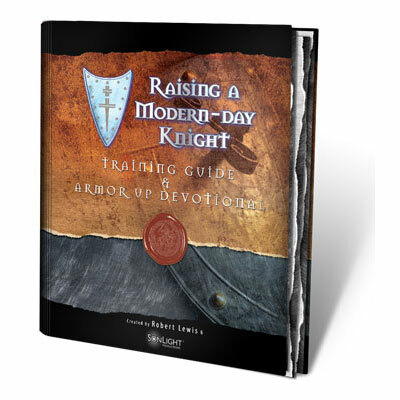 This Raising a Modern-Day Knight Training Guide will help you go the extra mile in your adventures with Raising a Modern-Day Knight. There are six adventure sessions that build on one another as well as a Round Table Discussion guide. Take time with other dads to share wisdom and insight, and encourage one another after each session. There are also weekly application projects to do with your son(s) that are simple, fun exercises in "Strategic Fatherhood." While participating in the study, set aside a few minutes each day to do the Armor Up daily devotionals that can be found at the end of Adventure I.
Robert Lewis Robert Lewis is the Executive Producer of Life Ready. He is well-known as the founder and creator of Men’s Fraternity. For over 20 years he served as Teaching Pastor and Directional Leader for Fellowship Bible Church in Little Rock, Arkansas. He also serves on the Board of Directors for the Leadership Network, and is on the Board of Fellowship Associates, a church consulting and leadership training organization.